I’ve been seeing the cutest little snow globes all over the web and thought I’d try my hand at it. I wanted to make them as gifts for a few of my friends at work. It was so much more frustrating that I thought it would be, mostly because of the glue and the jars I picked. Once I got it all figured out, I thought that they turned out very sweet. My first problem was the jars. They are from the wedding dept at the craft store and they have sides–front, back and one slanted side. This made it difficult to properly place the little figurines. I had to fix several because they weren’t looking out the ‘front’ window. They are small enough to make into ornaments, which is why I bought them. Those mini jelly jars would have been better, but where do you get those? Then there was the glue. At first I had tried E-6000. Only one stayed glued together in the water, and it was the one that I put together right away without allowing the glue to set overnight. Who knew? Should have been impatient with all of them! I then moved on to Gorilla glue and 2 part epoxy. Both worked well, but the gorilla glue foams up so you can only use a very small amount. The foam doesn’t bother me much, it looks like snow! All of the glues stink and they gave me a pretty good headache. Ventilation is key!! I’ve also seen that aquarium glue works well too. 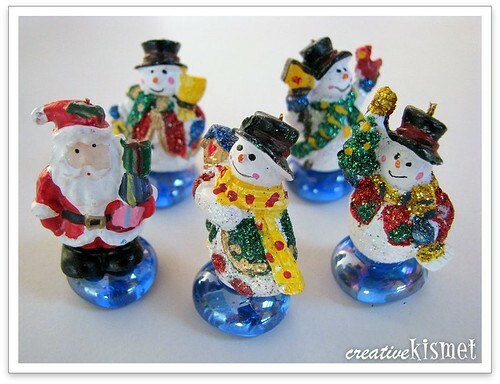 I glued the figurines (mini ornaments) onto glass stones, which helped them to be more visible in the globe, versus being so deep into the lid. The problem with this, is holding the figurines on the stones until the glue sets enough for them to stand alone. VERY time consuming. Once I got the glue figured out, everything came together very easily. You can find instructions HERE and HERE. Basically you need distilled water, glycerine and glitter. 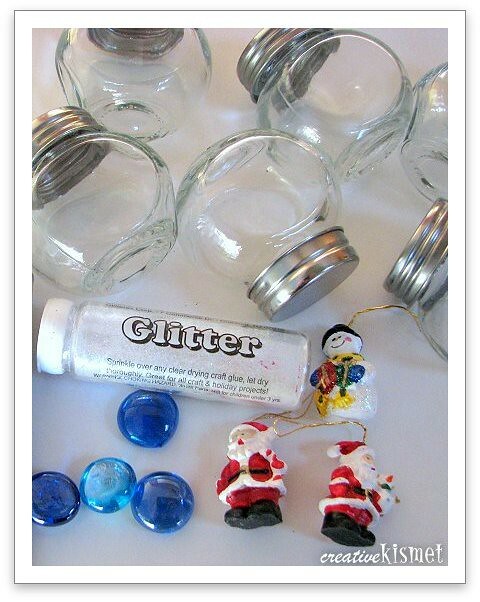 Once the jars are all filled, then the lids need to be glued on. I glued painted wood discs and buttons to the tops. Some have strings to hang, the others can just sit on a shelf. They are still a little on the heavy side, but would hang nicely on a strong branch. 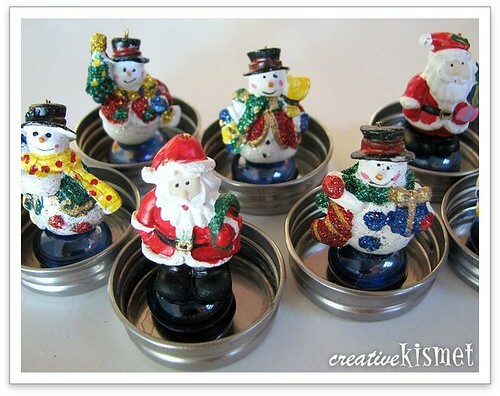 This entry was posted in Holiday Hoopla, Tutorials, how to. Bookmark the permalink. i love this! @ my 3 year old is kind of obsessed with these right now, so they will be really fun to make. Thanks for all of the tips. They turned out really cute. These turned out GREAT Regina. I had wanted to do these with the kids but I think I will wait until they are a bit older. 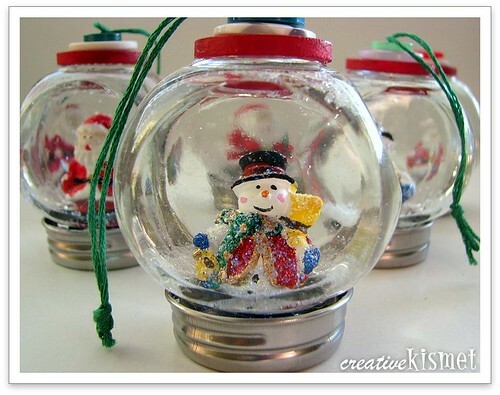 Your handmade snow globe ornaments are the best I’ve seen yet. They’re adorable and I love the fact that they’re small enough use as ornaments. Thanks for sharing. 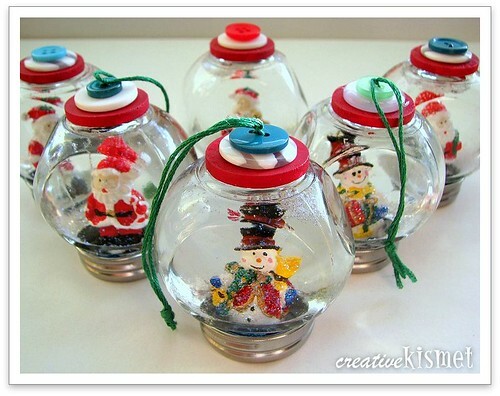 I have always been fascinated by snow globes, and I’ve always wanted to make some. Yours are absolutely fabulous! Thank you so much for sharing your process, both what worked and what didn’t. I will definitely save this post for my Projects To Do list!! Your friends will be very lucky to get these as gifts from you.